4264 108/17 50 years British administration 1928, fresh colors and in perfect condition unused. 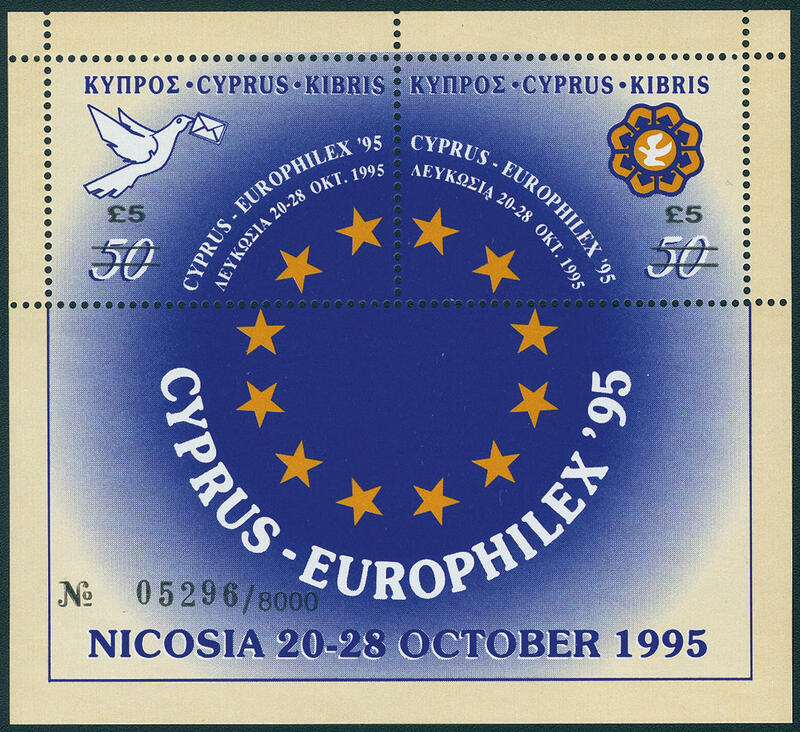 4265 Bl.18 EUROPHILEX-block 1995, in perfect condition mint never hinged, issued only 7290 piece. Michel 450,- €. 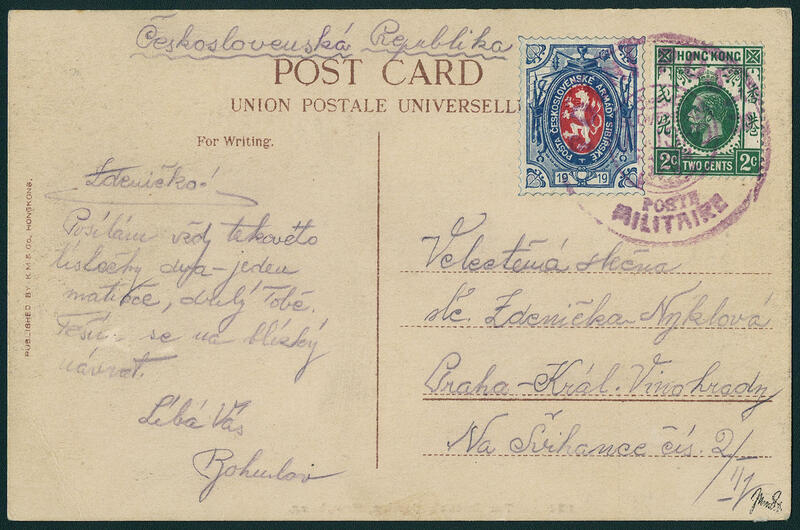 4243 ✉ 7 1 R. Blue / red, colored rouletted, military postal service stamp in combination with Hong Kong 2 C. On picture postcard with violet two ring cancel \"POLNI POSTA POSTE MILITAIRE CESKOSLOVENSKE VOJSKO NA RUSI\" to Prague addressed. A scarce and decorative memory card. This document is in the Ceresa handbook, ribbon 3, on page 112 depicted. The picture postcard shows the botanical backyard from Hong Kong. Photo expertize Eichele. 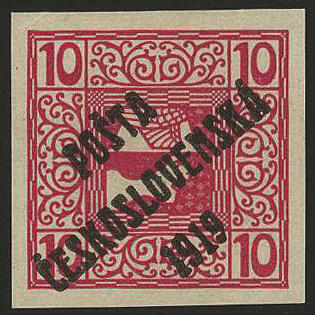 4244 98 10 Heller lilac red with overprint \"POSTA CESKOSLOVENSKA 1919\", wonderful fresh colors and large margins all around, in perfect condition mint never hinged a dreamlike nice outstanding quality this Czechoslovakia rarity for the highest standards. The edition amounted to be on only 250 piece! Photo expertize \"genuine and immaculate\" Darmietzel BPP. 3663 ⊙ 02. Jun Overprint set 1940 / 41, fresh colors and neat cancelled, expertized Dr. Debo BPP. Michel 350,- €. 3644 ✉ 2II Forwarded-letter from Brazil: 2 Rigsbank-Skilling, Thiele-pressure, wonderful having bright colors and on all sides piece in outstanding quality with enormous margins on very nice cover with clear turning into number postmark \"1 (Copenhagen) \" with additional Foot postmark \"F: 9.1.55. P\": to Copenhagen. The cover was in Rio de Janeiro / Brazil written with detailed text and private to Copenhagen brought. First there was he of the postal service hand over. A spectacular cover for the sophisticated Denmark or Brazil collection! Photo expertize let Nielsen. 3645 ✉ 3,6,7a 2 S. Blue, 4 S. Brown and 16 S. Greyish violet, all three values wonderful fresh colors and good margins as very nice three color franking on especially attractive cover as scarce international franking with Nrs. 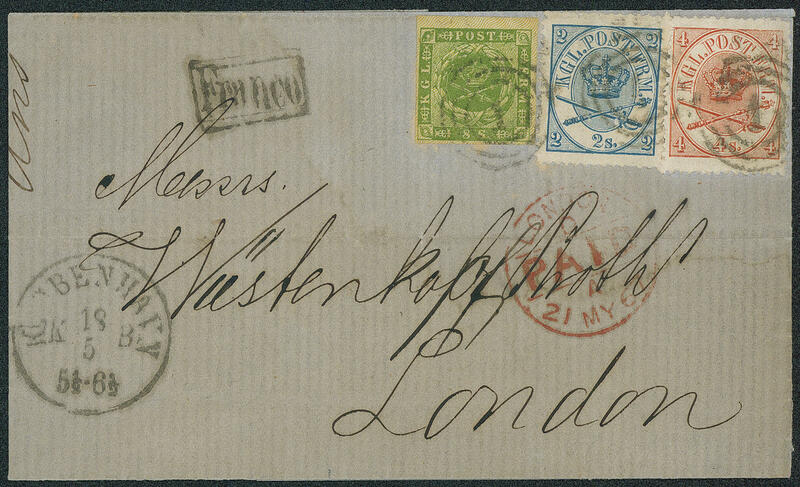 \"1\" and clear additional single circle postmark \"KJOBENHAVN 29.8. 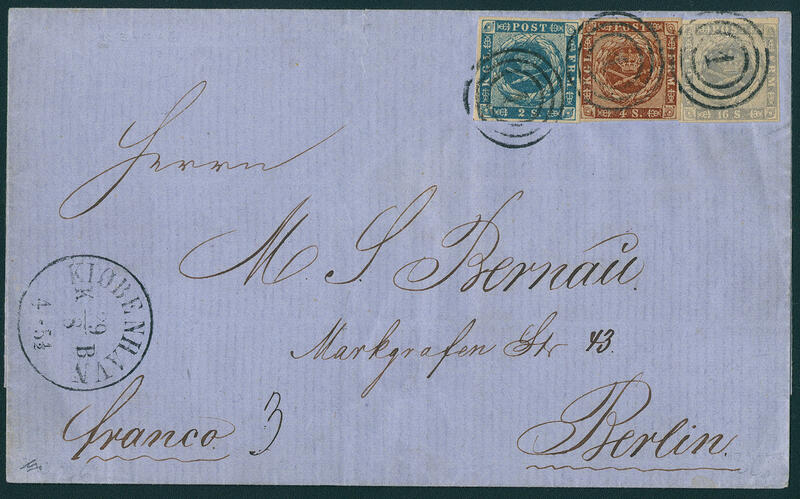 (1860) \" to Berlin. A fantastic cover for the highest standards! (Afa-no. 3, 6, 7). Photo expertize Möller BPP. 3646 ⊙ 4 4 Sk. 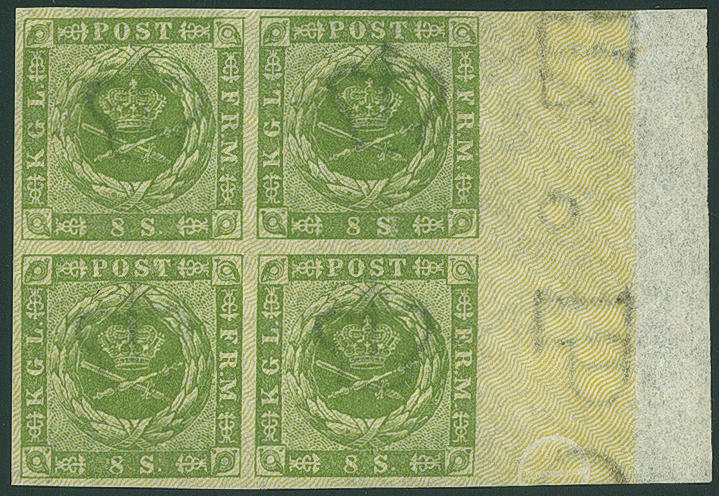 Yellow brown, issue 1854, horizontal strip of six, wonderful fresh colors and large margins all around with clean mounted number postmark \"53 (RANDERS) \". An extraordinarily scarce unit in outstanding quality. In this kind a Honor for the sophisticated special collection! Photo expertize Möller. 3647 5 8 S. Green, wonderful block of four, wonderful fresh colors and large margins all around with large right margin of sheet, in perfect condition mint never hinged in utterly perfect condition, without any signs. A piece of dream of this classical unit for the highest standards! 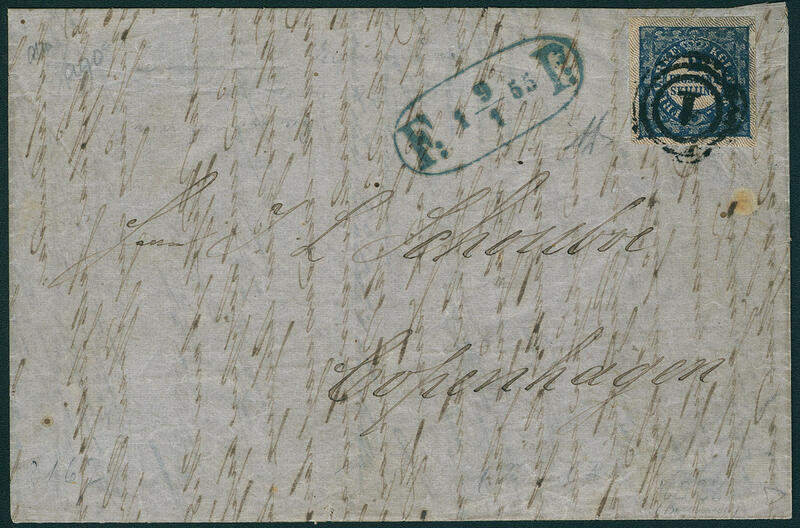 3648 ✉ 5,11,13 8 S. Green, fresh colors and good margins in mixed franking with 2 S. Blue and 4 S. Brick red on decorative small-format cover from \"Copenhagen 18.5.67\" to London with red entrance stamp. An especially attractive three color franking! 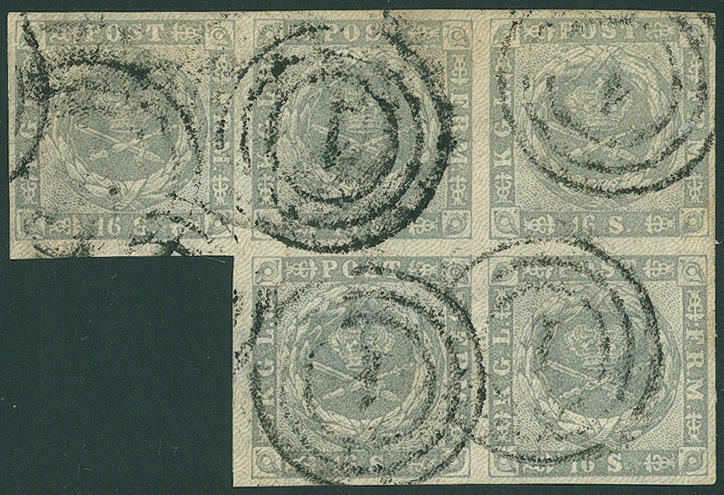 3649 ⊙ 6 16 S. Greyish violet, wonderful block of five this high denomination value, fresh colors and large margins all around with number postmark \"1 (Copenhagen) \". So large multiples are from of this denomination value extremely rare, which here is a particularly beautiful example! Photo expertize let Nielsen. 3650 ⊙ 6 16 Sk. 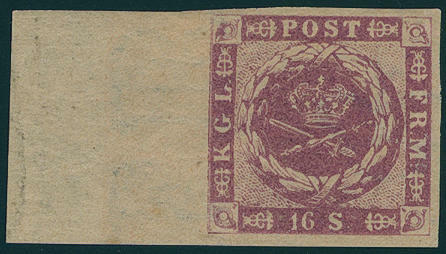 Gray violet, horizontal strip of three, wonderful fresh colors and with wide margins with number postmark \"1 (Copenhagen) \". A scarce unit this high denomination value in perfect condition. Outstanding quality! Photo expertize Diena. 3651 ⊙ 7a 4 Sk. Orange brown, first printing, horizontal strip of four, wonderful fresh colors and with wide margins with four perfect mounted clearly number cancel \"47 (NYKJOBING / FALSTER) \". A dreamlike nice unit for the highest standards! Photo expertize let Nielsen. 3652 ⊙ 8 8 Sk. 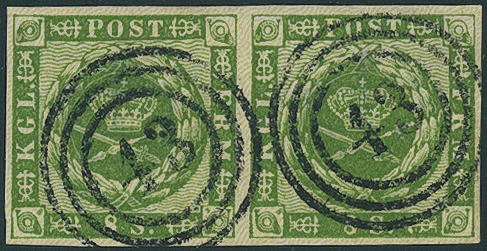 Green, horizontal pair, wonderful fresh colors and large margins all around with two neat and clear mounted number cancel \"43 (NAKSKOF) \". A piece of dream for your highest requirements! Photo expertize Paaskesen. 3653 10U 16 Sk. Red lilac without roulette, fresh colors and large margins all around, left with large margin of sheet, in perfect condition mint never hinged an exception copy of this scarce variety for the highest standards. 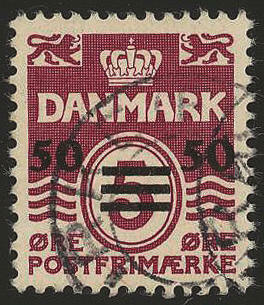 Especially in mint never hinged condition, in addition to it with so wide margin of sheet, a rarity the classic Denmark issues! (AFA-no. 10 a, Facit catalogue no. 10 v4). Photo certificate Kaiser. 3654 ✉ 11,13,14A 2 Sk. Blue, 4 Sk. Red and 8 Sk. Yellow brown, perforated K 13:12 1 / 2, fresh colors and in perfect condition as correctly franked three colours franking on cover, receiver name changed, cover folded, with duplex stamp \"181 SJAELL. P. B. 9.3. 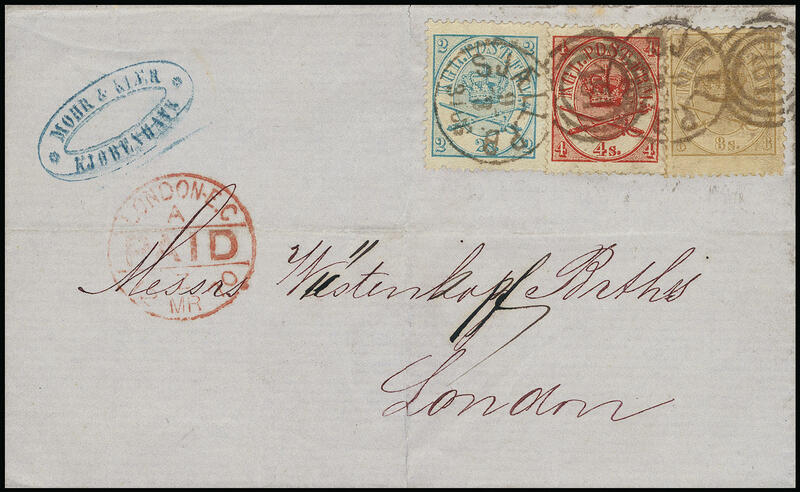 (1870) \" the railway mail, to London with red transit cancellation. 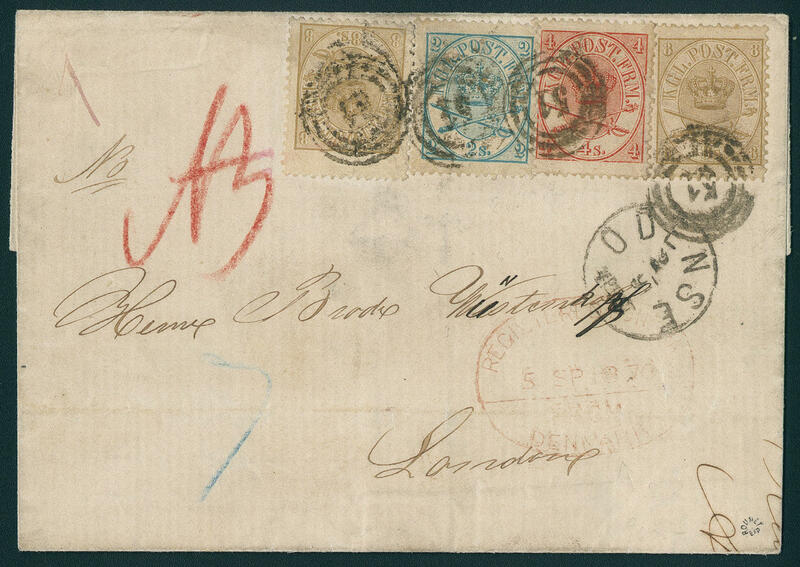 A scarce and attractive franking! Photo expertize Witschi. 3655 ✉ 11A,13Aa,14A 2 Sk. Blue, 4 Sk. Rose red and 8 Sk. 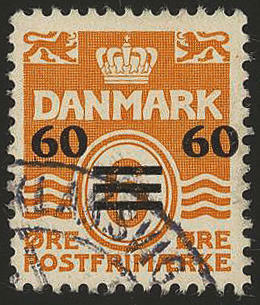 Pale brown (2), all values fresh colors and in perfect condition as particularly beautiful three colours franking on cover with number postmark \"51\" and additional single circle postmark \"ODENSE\" as registered to London with red oval transit cancellation \"REGISTERED LONDON FROM DENMARK 5. SP. 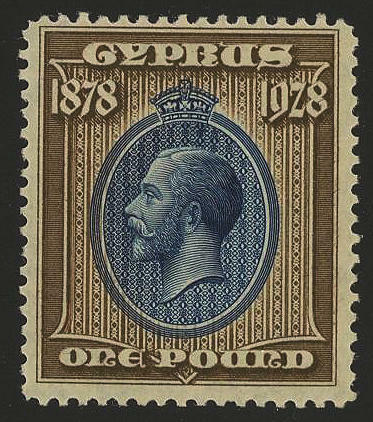 1870\". A very decorative and rare registered cover! Photo expertize Möller BPP. 3656 ✉ 66 5 Kr. 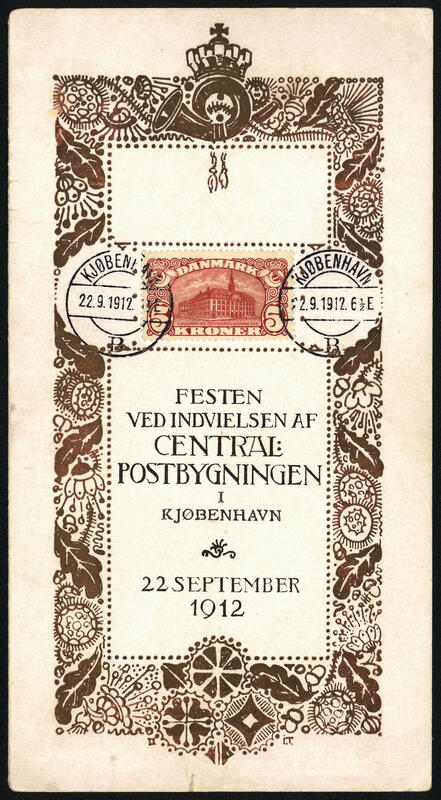 Main post office 1912 on especially nice complete dish folding map with order of courses and music programme, clear stamp \"KJOBENHAVN 22.9.12\". There are only few complete examples this menus have been preserved. A Honor for the advanced special collection! 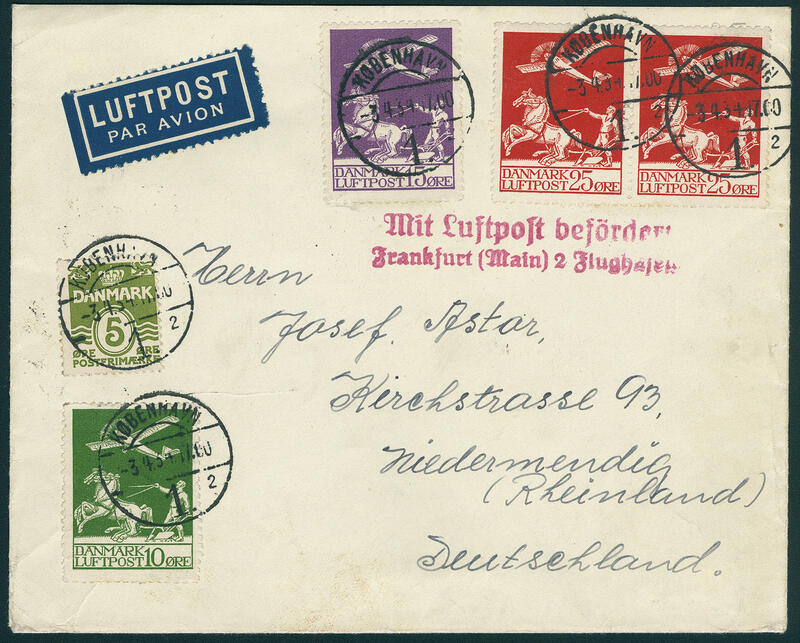 3658 ✉ 143/45 Airmail set on decorative air mail letter (key value in the horizontal pair) from \"KOBENHAVN 3.4.34. 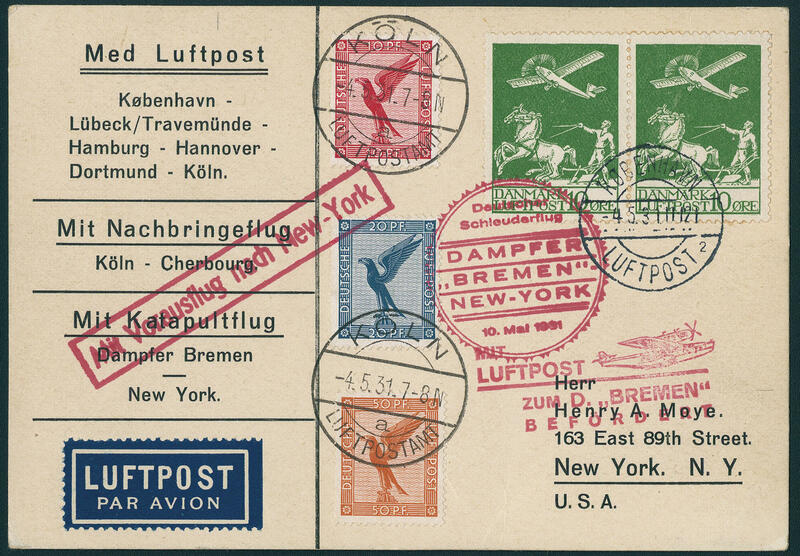 \" to Germany with transit and arrival postmarks.